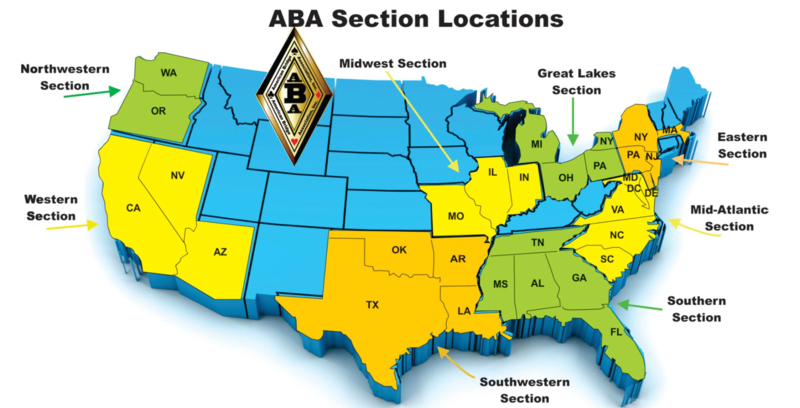 The ABA is Presently Divided Into Eight Sections: Each Section is a geographic and administrative subdivision of the Association. It encompasses all the individual Clubs and Units in a defined area of the country. A Vice President, assisted by a Secretary/Treasurer and a Section Committee, heads the section. The Section Committee is comprised of delegates from Clubs and Units in the Section. The Section Officers and the Section Committee govern the Section between annual meetings. The SECTION oversees the business of Units and Independent Clubs within its jurisdiction. The Section Vice-President is the chairperson of the section Committee and is a member of the Executive Board of the ABA. All applications for clubs and unit charters are subject to review by the section Vice-President. The section Vice-President must approve any sanctioned game in the section. The section provides for necessary meetings, conventions, tournaments and membership activity. It is a clearinghouse for tournament schedules within the section to avoid conflicts. It insures the collection, processing, and maintenance of sanctions, fees, schedules and other such data as may be stipulated. It insures implementation and communication of procedures, policies and all decisions affecting the interests of clubs, units and individuals within its jurisdiction. Each year, the Western Section conducts two tournaments (Spring and Fall) at which time the Bi-Annual Open Meetings are held. The section Vice-President is elected at the Spring Sectional every other year (odd year).